To crack heavily armoured targets, the Resistance called upon two squadrons of MG-100 StarFortress bombers laden with powerful proton bombs. The bombers were committed to another mission during the raid on Starkiller Base, but rushed back to D’Qar for the base’s evacuation. Escorted by swift starfighters, Cobalt Squadron attacked the initial wave of First Order warships to buy time for Leia Organa’s freedom fighters to escape. All of the bombers were lost, along with their crews, in this desperate mission. How did you get the tole of Resistance Bomber Pilot? Well, actually this job came to me via a recommendation by the casting director who thought I would be a perfect fit for the role of Resistance Bomber Finch Dallow. Not long before this opportunity came may way, I was successful in securing a role in Jurassic World: Fallen Kingdom. As a result of that audition process I was considered to be the right fit for what the studio and director was looking for. In other words, it was a kiss from the gods. I was incredibly fortunate to be considered the right man for this job and I will remain eternally grateful for the opportunity. Can you describe your experience working on The Last Jedi? Shooting Star Wars: TLJ was one of the most surreal experiences of my life! We shot down at Pinewood Studios which is like a top secret fortress when it comes to anything to do with Star Wars, as the studio understandably doesn’t want any information, material or photos etc to be leaked to the public. I remember being taking to my trailer shortly after I signed a non-disclosure agreement and had my fingerprints scanned! Yeah, like I said, top secret! If I say anymore, guys in black suits may turn up at my apartment? Anyway here goes.. After spending a little time in my trailer preparing, I was then invited to visit the set which is where I got to meet and introduce myself to Rian Johnson, the genius director behind what I think was a fun and refreshing take on the Star Wars franchise. He was very cool and I had a really interesting conversation with him. He’s an insanely nice guy and it was a pleasure to be directed by him. My overall experience was stunning and difficult to actually put into words as just being in the company such great artists and film makers is a massive amount of validation being a new actor in the game. You know that you are going to be part of history and that can be pressurising if you let those thoughts pervade your mind. So I didn’t. I just remained professional and as a result, Rian personally praised my performance. Love you Rian! What was it like working inside a Resistance Bomber? When I was called to set to begin filming my scene, I was totally mesmerised by the production value. The Resistance Bomber that the production team put together was the most elaborate thing I had ever seen. What you see in the movie is pretty much a fraction of what was actually going on inside the spacecraft itself. The cockpit was furnished with everything you would imagine to be in a Star Fortress from the pilots seat to each and every button, dial and instrument. The cockpit felt so real. All the dials were backlit and functional which made it very easy to immerse my imagination and “act” as if I was a seasoned pilot in the Cobalt Squadron. I was given a digital brief (on an iPad) before hand by one of the production assistants and shown in detail how the StarFortress Sf-17 would appear on the screen. This really helped me to put the performance in perspective. It was an immensely fun and rewarding experience as I was given the freedom to create my own performance which was later praised by Rian personally. On a production this huge I was surprised to be afforded so much freedom, which was made slightly more pressurising by the fact that the president of LucasFilm was standing at the monitor watching the whole process all the way through. Of course, your boy is as professional as they come, so, I handled it (He smiles)! Bottom line, hands down one of the best experiences of my life so far! What was your costume like to wear? I’ve always admired the Resistance/Rebellion pilot suits. I was initially invited to Pinewood Studios to undergo a costume fitting. This was very specific, as the costume team are extremely detailed and wanted me to be as comfortable as possible. The pilots generally all wear jumpsuits which are primarily tucked into a pair of boots. After putting on the jumpsuit, a utility vest is then worn which also has fixings on the legs as seen being worn by the Resistance Star Fleets in most of the Star Wars movies. At first the jumpsuit seems quite heavy as it made from a type of canvas material, but after a while you get used to it. The sheer excitement of wearing the suit will have have you quickly forget any form of discomfort at all! 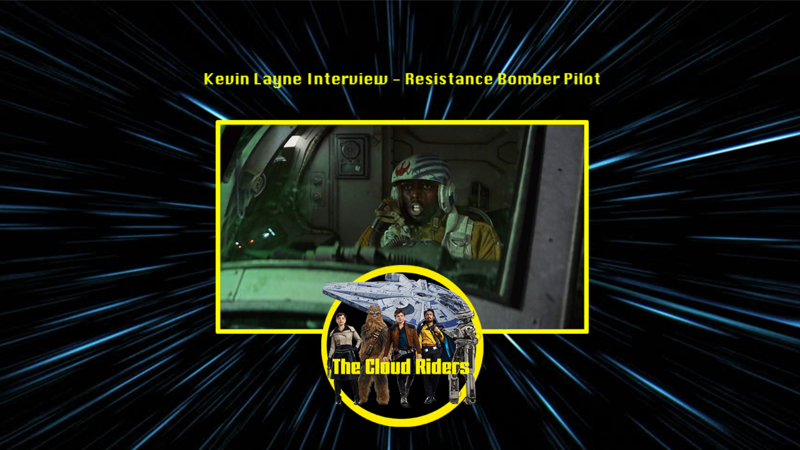 Overall, the costume was very pleasing to wear, and when the amazing costume team added the final touches i.e the helmet, gloves etc, it was amazing to see the finished article; Me, Kevin Layne- Resistance Bomber Pilot! How does working on Star Wars compare to other projects you have worked on? Working on Star Wars is a singular experience in itself! The sheer magnitude of the production is immense. It’s more of a childhood dream come true type of moment, for me anyway. I could have never thought in my whole career I’d have the opportunity to work on a project that I have such a personal affinity with. A friend from primary school messaged me saying “Do you remember when you used to play Star Wars in the school playground?”. My reply was simply “Yes man, yes!” His response was “Mate, you’re a legend!” What more is there to say? Having worked on another massive franchise; Jurassic World: Fallen Kingdom, I can say that I have been extremely blessed to be considered for these parts, but as an actor, you always want a character that you can explore and develop. As these were small yet significant characters, I didn’t quite get to do that, but I have a film coming out in the new year called L’Intervention. In this film I play a character called Barkhad who is the leader of the Somali Coast Liberation Front who attempts to liberate French Somaliland and attach it to Somalia. I really got to sink my teeth into this character and I cant wait for people to see it. What were some of your favourite moments on set? Where to start..? Arriving at the Pinewood Studios has to be the first. Just the mere atmosphere and energy that surrounds the set of a Star Wars movie is epic! Being taken to my trailer and being made to feel like a superstar was also rather rewarding. Everyone was just so accommodating to me. After settling down in my trailer I heard a knock on the door. One of the production assistants thought it might be nice to invite me down to the set to see what Rian was shooting. Of course, I obliged. So there we were, together in the golf car heading to the set. When we arrived I was introduced to Rian Johnson (Director) and we immediately hit it off! He’s such a humble, pleasant and talented guy. He was in the process of shooting a lightsaber scene with Adam Driver and I had the honour of being able to witness the technical process of shooting that scene, which was awesome. The conversation I had with Rian was just insightful, and I also had the privilege of meeting the president of Lucasfilm herself, Kathleen Kennedy. What are some of your favourite scenes from the Star Wars movies and why? My favourite scenes from Star Wars films usually involve the flyboys or the Jedi members. One scene in particular that stands out in my memory is the assault on the Death Star from A New Hope. The whole sequence is epic, tense and exciting. Watching the pilots being picked off one by one leaving Luke Skywalker to save the day backed up by the trusty Han Solo is the stuff of legend! I literally cant even forget that scene. It has a way of sticking to the memory. Like I say, Star Wars is something I grew up with and is sort of institutionalised into our society. In addition to this scene is the battle between Luke Skywalker and Darth Vader and the big reveal at the end. Another classic moment for me. Who are some of your favourite characters from the franchise? My favourite characters in the Star Wars universe are Han Solo, Lando Calrissian, Yoda, Obi Wan Kenobi and Luke Skywalker. The dynamic and back story of Solo and Calrissian is intriguing and fun to watch. They both exude a different kind of coolness and are a pleasure to watch on screen. The wisdom of Obi Wan and Yoda also adds great balance to the film and a depth and gravitas that makes the whole Saga more poignant. Luke is the driving force of the saga and his inexperience and lack of awareness of his own power is a clever aspect to the franchise and allows the viewer to see his development and growth over the course of the episodes. His story line is also very interesting and fun to watch play out. He never actually finished his Jedi training with Yoda from what I remember, but the force is so strong with Luke that he was able to harness his power regardless. Of course there are many other characters who are fantastic to watch for example; Princess Leia, Chewbacca, R2D2, C3PO, Darth Vader and many others, but the guys mentioned in my favourites list are the juice for me! Star Wars to me is a part of my childhood. I literally grew up with Star Wars in my psyche and it was a big part of my cinematic journey. I’ve always been a major movie lover and allowed myself to be totally immersed in the world of film whenever I engage with it. Star Wars was a literal escape and journey into another world in which characters existed that I could relate to and also wanted to be! Watching Lando on screen was also great in that he reflected diversity but in a way that you would want to see yourself. Cool, confident, smooth, clever and powerful. He may have been a little double crossing and dodgy at times, but hey, he was still the man in my eyes. Similarly Solo represented the same type of cool, but in a maverick type of fashion. The fastest gun in the universe kind of guy, with the swagger to match. I could go on all day about these characters, but on the whole, Star Wars shaped the way I viewed cinema, forever! You recently appeared at London Film Fair, can we expect to see you at more conventions in the coming future, and how does it feel meeting your fans? Yes, the London Film Fair was totally awesome!!! I have plans to attend as many more conventions as I can in the coming new year. Being able to go to these conventions and interact with the fans of the Star Wars universe or just fans of film in general is an amazing experience that can’t quite be put into words. People came from far and wide to meet me at the London Film Fair and they were so enthusiastic to talk to me and engage. It is a unique experience, and much more connective when meeting fans up front and personal. The love I received from each and every fan was lasting and it certainly gave me in impetus to want to meet more fans in the future. On that note I’d like to say much love to all of my fans, and I hope to meet as many of you as I can on this wonderful journey I am travelling. Viva Star Wars!! !